Posted on 06/16/2017 06/16/2017 by Desert Dweller | David C.
Or at least with a little skill, they are! 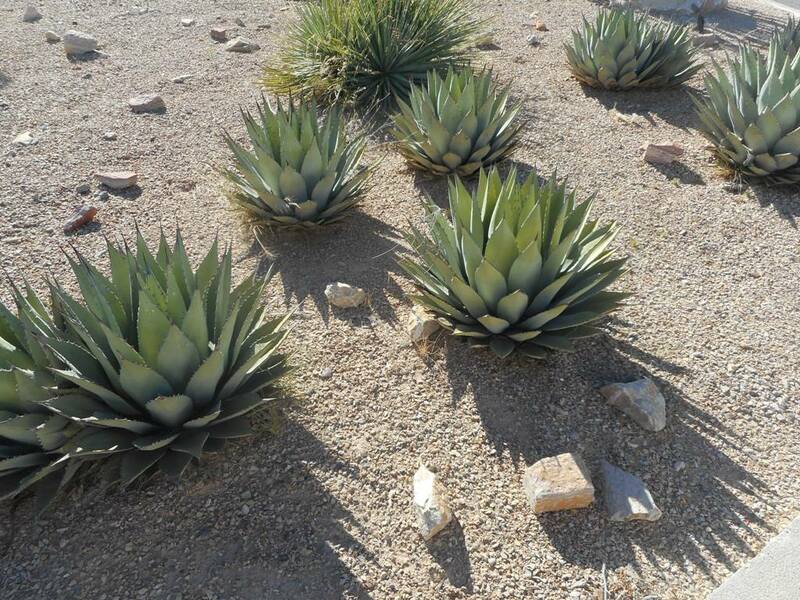 Someone once summarized my design philosophy as “inspired by nature (desert)”. 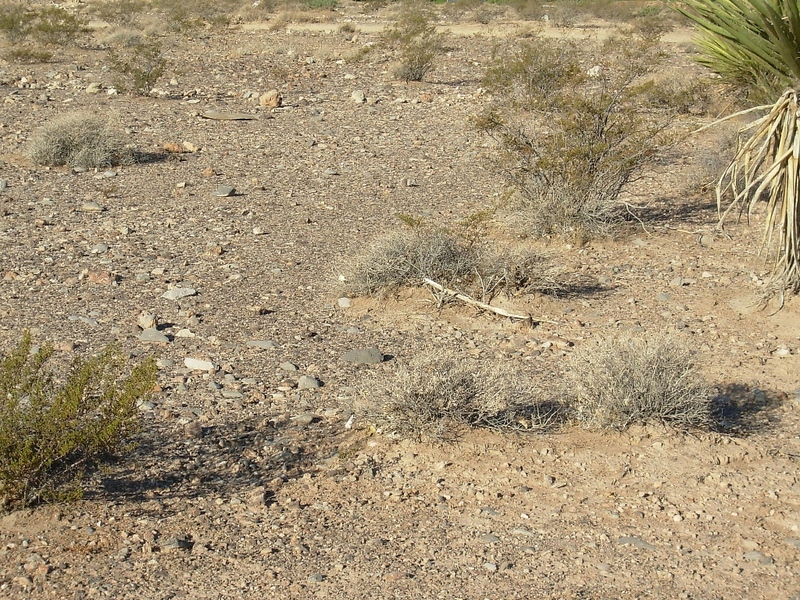 Here behind an unfulfilled project in the Mojave Desert outside Las Vegas: rock cover of various sizes, thin plant cover. 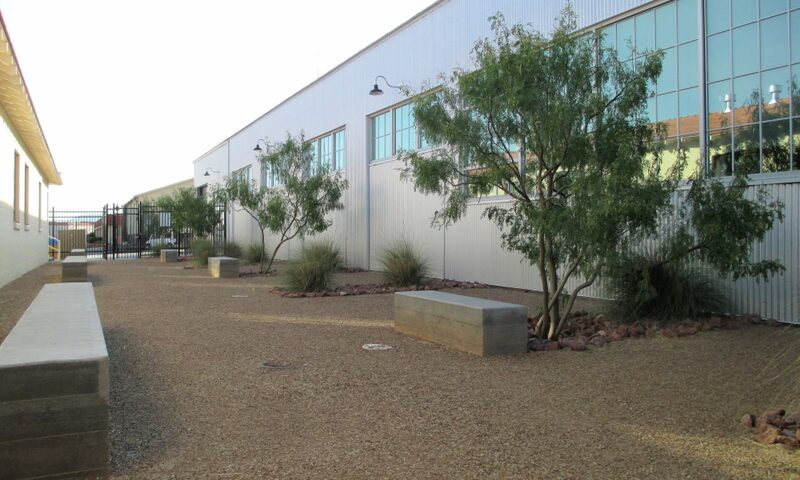 Desert pavement is the term for the ground surface in many shrub desert communities, and it is a great model for the aesthetic and function of gravel mulch in the arid-region garden. After all, desert pavement in the wild serves as mulch. The owner had their contractor do this on one of my designs. They tried, but the larger rocks need to have been impressed, or filled in between using the overall, smaller gravel mulch, to avoid looking contrived. Almost! 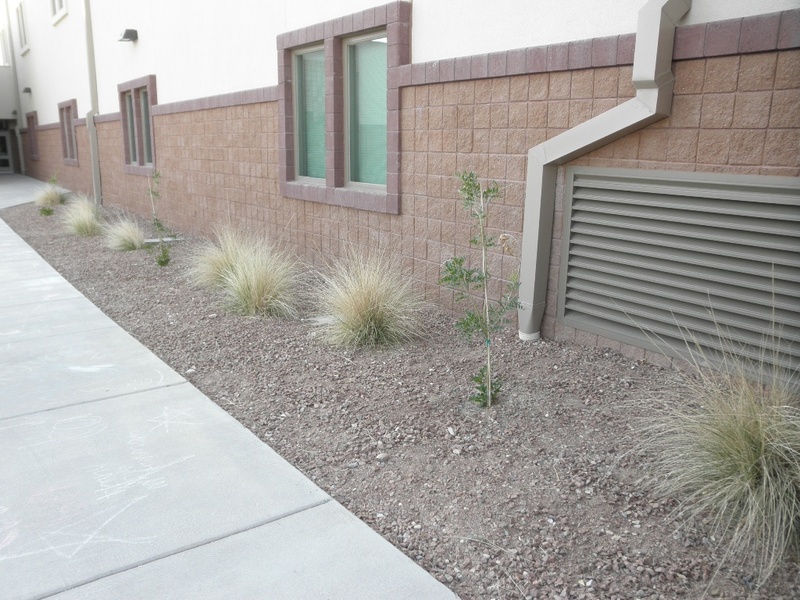 I specified this at a school design nearby, and it worked: 50 percent 3/8″ gravel mulch and 50 percent 3/4″ gravel mulch. The architect didn’t get it, didn’t try, and he’s from El Paso. One cannot miss seeing this very same effect on the groundplane, on any hike or travel into our area’s creosote bush scrub. And an architect, who has more design savvy. If some 2-4″ rock had been added to the mulch mix, his approval might have been even less. I tried, but easy isn’t so easy. People are the main limit, not reality. Tree stakes…do you really think they need to remain after the first year, let alone 9 years later, with 4-6″ caliper trunks and obviously quite establish and sturdy? Disagreeing and not removing the stakes will not prove anyone right; it will girdle and damage the tree, possibly killing it. You make a good point! When I see my designs that have been installed by others I am always disappointed. They change plants and don’t keep the lines where I put them. Go for cheaper materials etc. It is frustrated and I feel bad for the clients! At least in this case, the owner did it and almost pulled it off. Others, not so! I would have a design-build division for residential if I did it all over again. Staking and amaintenance!!! 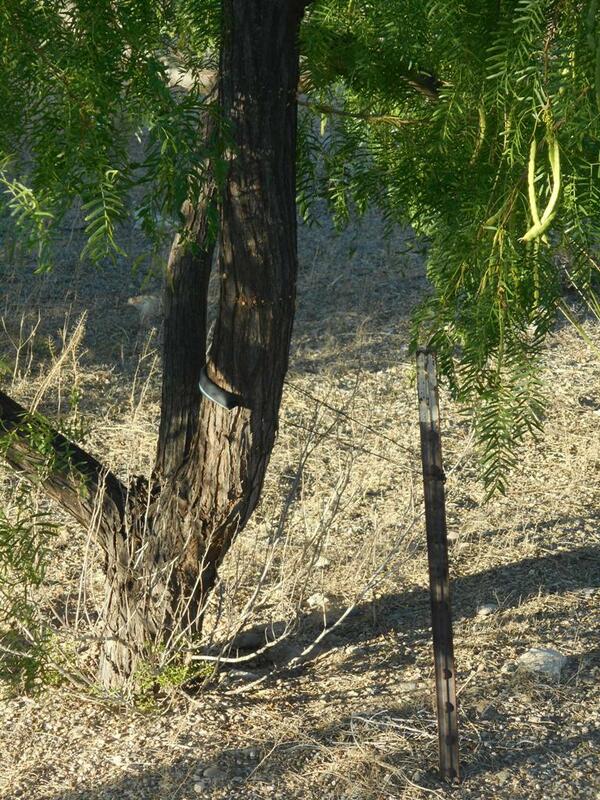 I’m guessing that’s a honey mesquite, right! Love those! But my particular conventional wisdom — from an “ol’ wives’ tale” upbringing (from rural D-FW) — intuits me to feel those metal posts, several feet from the tree trunk like that, sooner or later provide good iron nutrients to the soil, for that tree. Is that old thinking wrong? Certainly that tie needs to be removed. Extra iron is a good point, though I’m unsure if that is needed in those deep sandy soils. 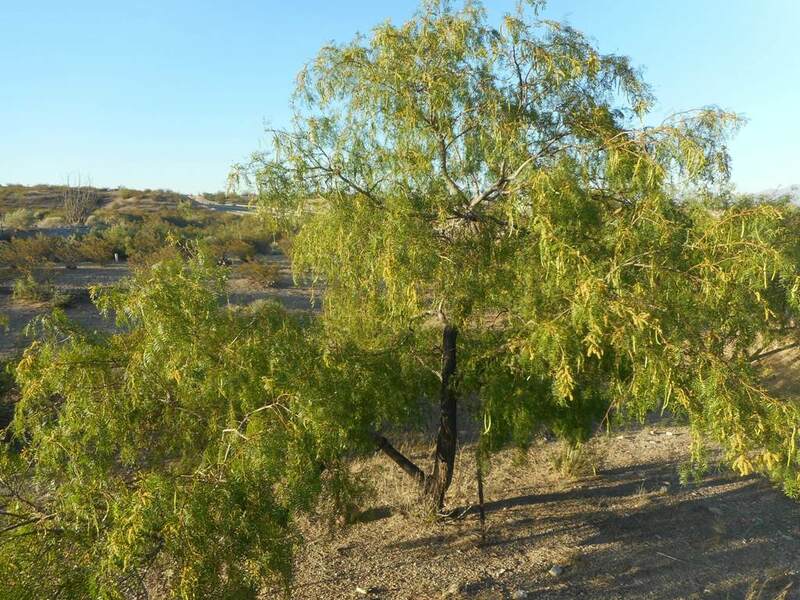 I have seen acid soil-loving trees succeed in alkaline clay soils after a construction site dumped all kinds of nails in a large area, which then rust in the root zone’s soil. And yes – get those ties out of there!